Next up as promised is the Minolta AF 75-300mm F/4.5-5.6 review. This is a lens that I wanted to like, and hoped would live up to the hype, but in the end, it really seems better suited for the history books. 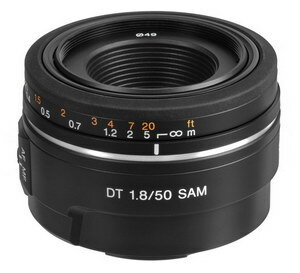 This lens has loads of color fringing, both axial and lateral. It sharpens up nicely at F/8 at the long end, and is pretty sharp wide open at 75mm. It's a long, heavy lens, as opposed to the lighter and shorter Sony 75-300mm F/4.5-5.6, which turned in about the same performance as the Minolta. I'd have to recommend the Sony to someone if they were interested in this focal length. Better yet, forget both of those, and buy the much better Sony 70-300mm F/4.5-5.6 SSM G lens. Note; I re-shot the Sony 75-300mm bokeh crops, so the comparisons are more even. I think I'll clarify a few things that I mentioned yesterday, since some people may not understand what I'm talking about. One; I said I'd buy a full frame camera before I'd buy a second APS-C body (that is, if I didn't already have one). 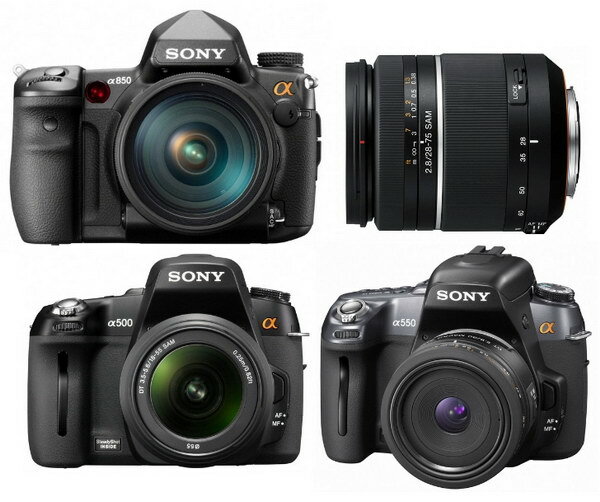 Two; I'd rather have the A700 because of better features, instead of the new "mid-level" A550/500 APS-C bodies. If you're thinking of moving up to a full frame body, be aware of a few issues that full frame coverage (in most cases) exacerbates. The corners will be softer at the same apertures if you're using the same full frame compatible lens, You'll also see more intense lateral color fringing, more light fall-off, and more distortion, that's just the nature of the design; you're only using the middle portion of the lens (the best part) with APS-C bodies. Then why would I buy one? I like the big, bright viewfinder that shows everything (A900, not sure about the A850), I also like the "real" focal lengths, not the equivalent, which many times is too long, like 70mm on a 70-300mm SSM lens, where 70mm is still useful with full frame, but turns to 105mm coverage on a cropped sensor camera, and that's a bit too long for me. I don't worry too much about sharp corners and the other stuff mentioned, probably because I don't enlarge my images to poster sizes. Bottom line; if you stare at your images blown way up on your computer screen and worry about the corners, you'd be better off sticking with an APS-C camera. The second item concerns the A700 specific features and differences with the newer Sony APS-C cameras. I said I'd rather have the A700 instead of the A500/550. The A700 has two control dials, front and back. I use the two control dials nearly every shot, and with the A700, I can customize both, the other bodies have only one front dial. I set the front to aperture, and the rear to exposure compensation. I also use the dedicated AF/MF button, (also not available on other bodies), which I set to one click on, one click off. In addition to those items, I use the ±3.0 stop exposure compensation, as opposed to the lesser ±2.0 on all other APS-C bodies. I use ±3.0 for indoor exposure blending in real estate shooting, and often when testing lenses, 2 stops sometimes aren't quite enough (The A550/500 have auto HDR, but only combine two frames). If you don't use the above mentioned items, then by all means consider the new cameras, which have the flip screens and live view, which some people can't live without. Hope that clears things up. Stay tuned for the Minolta AF 75-300mm F/4.5-5.6 "Big Beercan" review in the next couple of days. Sony unleashes some new DSLR photo products; three cameras and a new lens that was actually unleashed a few months ago, I guess we need reminding(!) The A550 and A500 were no surprise, and are supposed to be an upgrade from the 330-380 series, but not the A700, which has better features for people that really use a camera. They are using a new sensor that promises less noise at high ISOs, we'll see. The A850 was a surprise to me, It looks to be a A900 without the full 100% viewfinder, and $700 less coin ($1999 body only, available 9/09). I'd buy one of those before I'd buy a second APS-C body. I'd also buy an A700 for $999, instead of the A550 for $950 if you're considering upgrading or require a more advanced APS-C camera. I was hoping Sony would come out with an A700 replacement, but it looks like the wait may be a little longer. The new 28-75mm F/2.8 lens appears to be the same, or very similar to the Tamron, and the Konica Minolta 28-75mm F/2.8 lens I reviewed here. The specs and size are about the same. This lens was pretty good on APS-C cameras, but had very soft corners with full frame coverage. The selling price is listed at $800, for about $100 more you can get the much better Minolta 28-70mm F/2.8 G lens, used. I most likely won't be reviewing the lens if it turns out to be the same as the older version, and probably won't be reviewing the new cameras either, as I'm happy with what I have, and don't receive (or ask for) loaners from Sony. Oh, I forgot to mention the original Minolta AF lens manuals I'm scanning and posting on a separate page. I've added the page (Minolta AF lens manuals) to the Nav bar on the left. I'll be providing a link in each lens review (if available) listed on the manuals. 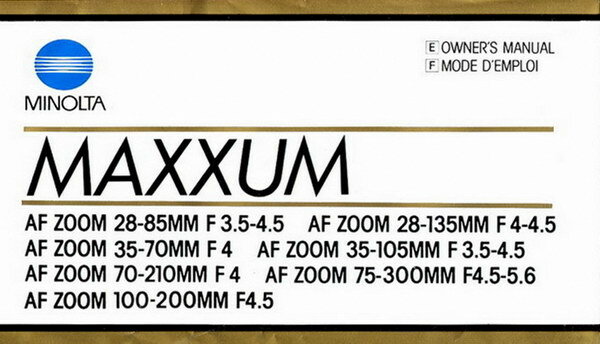 You'll notice there is more than one lens per manual. So far I've listed two manuals, and have them in English and French. If you have them in different languages, or have other manuals, please email me and let me know what you have. Scanning and sending a manual would be a good way to support the site, and help me keep adding new and useful information. I have the Minolta AF 28-135mm F/4-4.5 review ready. This is the first lens review done at the new address, so check out the fresh cropped images! I think I've kept the continuity of the reviews intact, and have added some mid-zoom crops, so let me know what you think. I plan on reviewing the Minolta AF 75-300mm F/4.5-5.6 "big beercan" lens next, and if everything goes as planned, it should be ready by the end of the month. I decided on a few changes to the site, one of which is the elimination of the Camera specs page. There won't be any more camera specs other than Sony DSLR's, from the first A100 model, to the latest. They'll all be listed on the Sony DSLR page, it's on the Nav bar to the left. I managed to add to, and tweak the useful links page. I noticed a couple of sites either made a disclosure about corporate support, or failed to disclose support, and/or relationships. I tested a couple of polarizers, trying to see if I noticed any loss of quality or sharpness with the A700, and Sony 100mm macro. I did notice a greenish blob centered in some of my product shots using a B&W MRC polarizer, which is no better than my cheap Hoya polarizer. I quit using it for that reason, plus the loss of light, the shutter speeds at F/22 got to be almost 10 seconds at ISO 200!! Sharpness differences were not noticeable in regular shots, but slight color variations did occur depending on polarizer rotation and light angle. 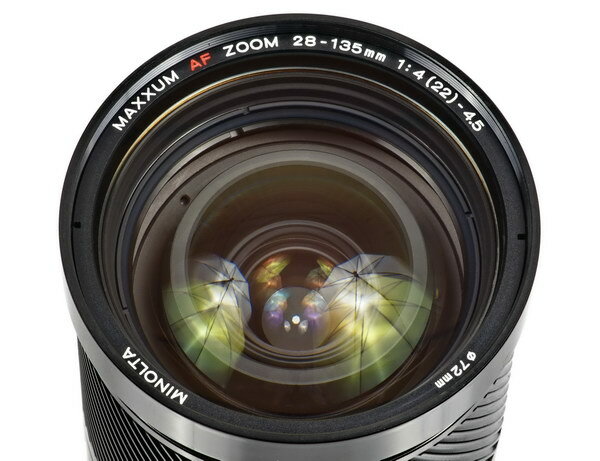 Thanks to a reader in Norway, Miguel, for scanning and sending the new Sony lens Brochure. It's got all the new lenses, and lists features such as "ED" glass, aspherical elements, and other specs. I see by looking at the brochure that they now have "SUPER ED" glass, which is available only on the new Carl Zeiss 16-35mm F/2.8 lens. 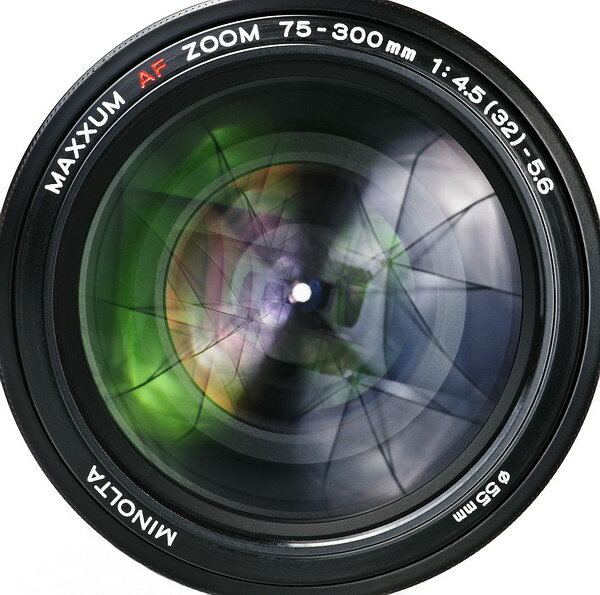 I'm going to review that lens soon, so we'll see if the "SUPER" is any better than the plain old "ED" glass!! Funny, but one of the best Sony lenses at controlling color fringing is the CZ 16-80mm, which has no "ED" glass, but uses T * coatings. Is that better than "ED" glass? I smell marketing gimmicks here! Next up will be a review of the Minolta AF 28-135mm F/4-4.5. I'm already working on it, and plan to have it posted before the end of the month. Last, but not least, you're not going to see the colorful 'Native Crops" corn stamp macro shot that I've been using the past three years. I managed to ruin that particular stamp during the recent move. I had a few extras, but they were so much different when magnified, that I decided not to use them because people will try to directly compare the shots, and then come to the wrong conclusion. So instead of the corn stamp, get ready for three years of the new "Red-headed Woodpecker" 2¢ stamp. I don't know, I may change it to something a little sharper, (and without the litho rosettes) in the future. Since many people ask how I make my product shots, I decided to whip up a product shot "how-to" article, which I started recently, and just finished today. This page contains information about how I make my product shots, using cheap lighting equipment, standard photo editing software, and of course, a Sony camera and lens. I'm not an expert in taking product shots, but I think I do a decent job with what I have. 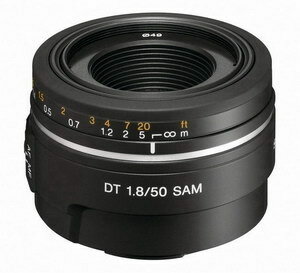 I've tried to duplicate and compare my shot in the article to Sony's press release shot for the Sony DT 50mm F/1.8 SAM lens. I point out the differences, and my mistakes at the bottom of the page. Click on the pictures to go to the "product shot article." I'm back folks, and the move across town has been completed!! I now reside in Oro Valley, just north of Tucson. I was living in the northeast part of Tucson (Catalina Foothills) before. I'm very close to a great hike now, Pusch peak, which goes from 2700' to 5350' (823m-1631m) in elevation in less than two miles (3.2km), that's a lung buster if you do it in an hour or less-one way!! I had several reasons for selling my house, thought I won't bore you with that yet. I thought the time was right to put it on the market, and it worked out as I sold mine in 30 days to cash buyers! They wanted me out of the house fast, so I'm now in an apartment for the short term. The reason I left the foothills area is this apartment in Oro Valley was the only place that had a good view, and could accommodate a quick move-in. I'll post some final shots of the old house and some new shots of the apt complex with more info in the coming days. Up next is a short guide to taking product shots. I'm no expert, but many people write and ask what I use for lighting and camera equipment, and how I post-process the images. This guide should clear things up. On a side note; the pictures in this guide and some of the up-coming lens reviews will be from the old house, because that's where I started the review.